The footballing gods must be smiling down on me again, as they’ve bestowed another gift upon me: awaiting my arrival on Monday evening after work was another box full of awesome from my good friends over at Umbro. Perhaps an early birthday present, as it was delivered to me just a few days shy of my 30th birthday (today, the day of posting… hooray to being a full-fledged adult). 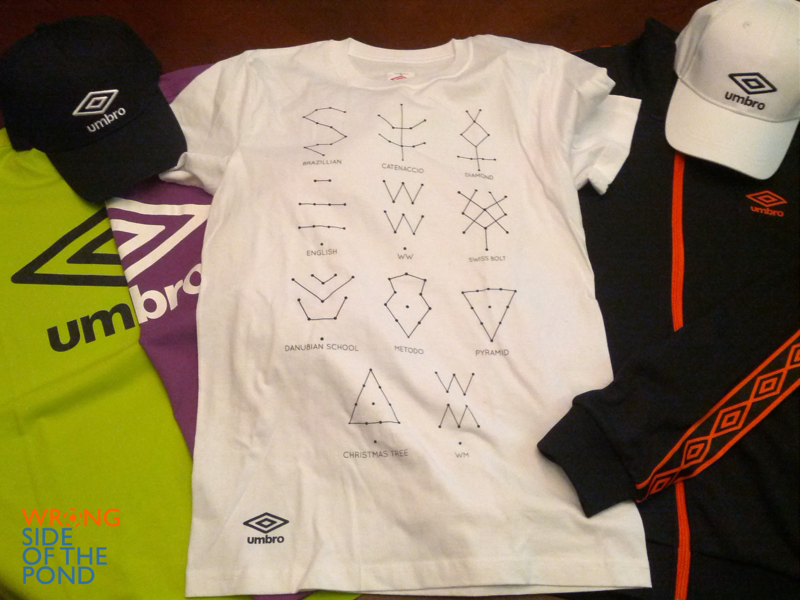 thanks to umbro, it looks like my wardrobe is set for the next few days. Unlike the first shipment the British sportswear giant sent my direction back in September, this particular smattering of Tailored by Umbro gear wasn’t from a single collection. Instead, they provided me a cross-section of their catalog to which their finer attention to design and crafting have had impacted. And right off the bat, what was most impressive to me with this shipment was that, despite everything they sent me being what most would consider to be basics or filler portions of their product line up, attention to detail and craftsmanship were still important. Up first are a pair of their simple Logo T-Shirts: one for me in neon yellow, and one for the wife in girly purple… though to be honest, if it had fit, I would have worn it. 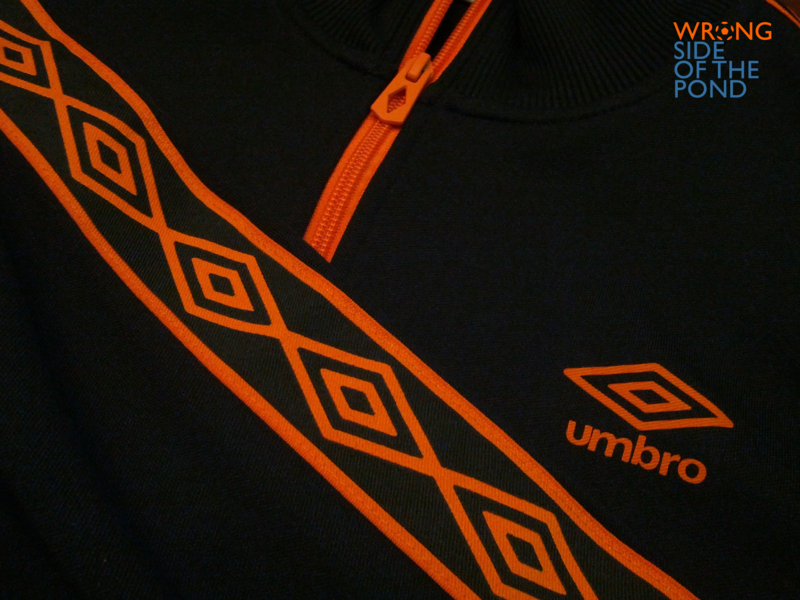 Like much of Umbro’s designs, their extremely simple. Most wouldn’t give them a second look save for perhaps their bold and bright colors. But on closer inspection, the quality really starts to shine through. the taping on the logo tee wasn’t only stylish, but also functional. Despite being a 65/35 cotton/polyester blend, they way it’s woven gives it a similar feeling to one of their jerseys. Which if you didn’t know, are ridiculously comfortable. But it’s not just how comfy the fabric the used is, but also the quality in which it’s stitched together that makes these standout from just being your average t-shirt with a logo on it. 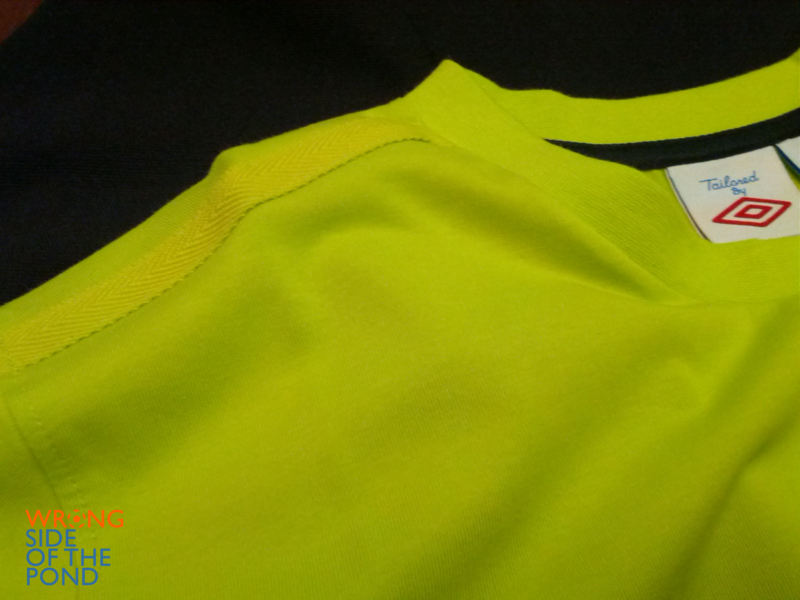 In addition to the diamond reinforced taping that strengthens the collar seam (another common trait with their jerseys), there’s also reinforced taping that runs down from the collar along the external shoulder seam to the start of the sleeve. While this obviously helps to prevent tearing, it also subtly enhances the shirt’s design and appeal. Not only that, but even the logo on the front of the shirt seems very sturdy: like it’s been pressed on instead of screen printed. Whether it strips away or cracks due to continued wear and washing, only time will tell. Also included were a pair of their Basic Caps, one in white and one in black. Though certainly short on frills, the logo stitching is done well enough where you don’t have to worry about snagging it, and I’m a fan of velcro closures on non-fitted hats too. if you stare up at the night sky long enough, you’ll eventually find football in the stars. Up next is a real gem: from the Umbro Tee Shop, the truly stellar “Footbll Stars” tee. 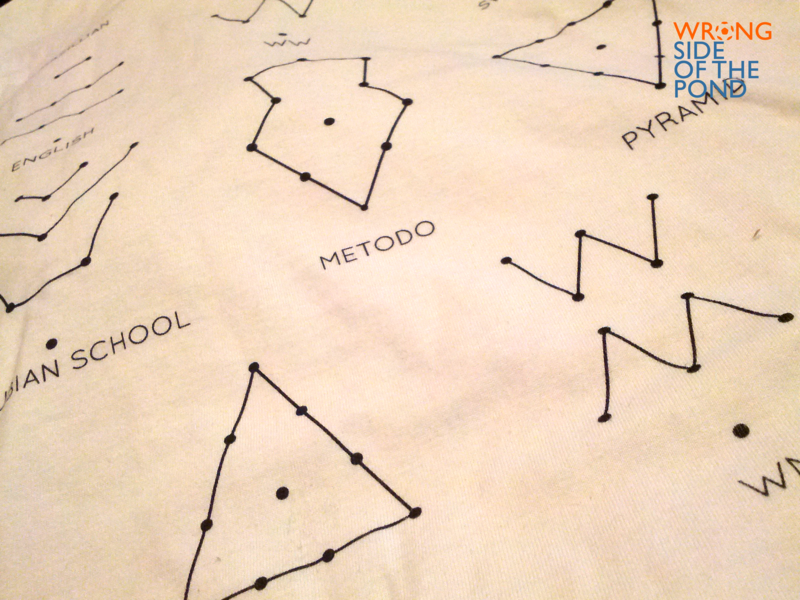 Depicted on the shirt are eleven classic formations, with the twist being they are each depicted as if they were constellations. The Tee Shop is one of my favorite offshoots from the Tailored by Umbro line, with a full range of cleverly designed football culture tees. Thanks to their slim cut shape, they’re also perfect for dressing down but still managing to looking sharp. And if nothing else, they prove to be quite the conversation starter, too. However as much as I love the stars tee, my pick of the shipment still has to be the Diamond Icons Track Jacket. First off, I don’t know if Umbro dove into my social media history and found out that the black and orange jacket perfectly matches my collegiate colors and those of my favored Cincinnati Bengals (forgive me, for I do like the handegg variant of football to a certain extent), but I’m completely okay if they did. 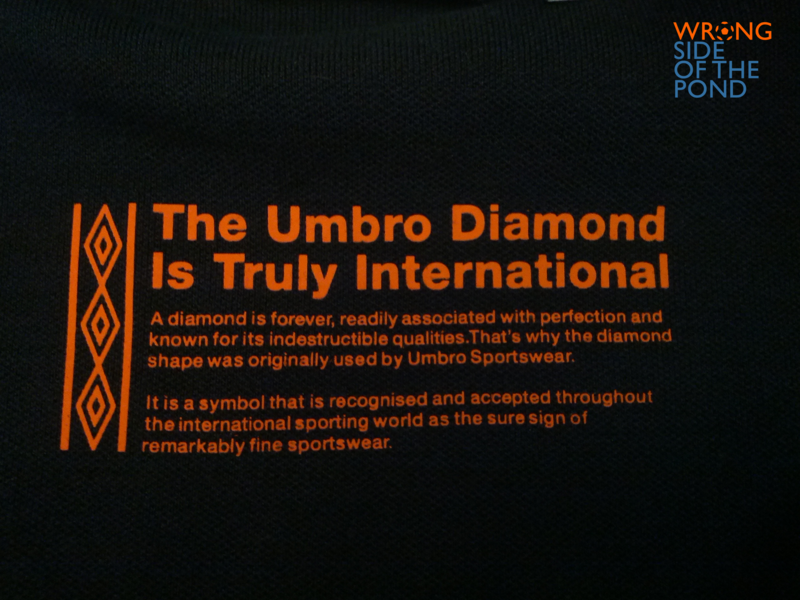 Color aside, what I really dig about the Diamond Icons jacket is how it oozes old school Umbro appeal. I grew up rocking Umbro, and at one point or another I had a jacket that looked remarkably similar to this one… so forgive me if nostalgia is tugging at my heart-strings on this one, a bit. But how can you not love the diamond taping running down the sleeves? The ribbed collar, cuffs and base of the jacket are a testament to the 1970’s track jacket from which it takes its spiritual design. And thanks to the solid construction that’s found in all of the Tailored By line mentioned above, it seems like it should be pretty durable. Hell, the jacket even brags about its “indestructible qualities” on the inside of the collar, and calls itself a “garment of distinction” on another tag. You have to admire that confidence, and it’s rightful boasting if you ask me. So in summary, I think if this latest shipment of goods from Umbro tells me anything, is it’s that their obsessive attention to detail in their product design isn’t just reserved for their high-profile clients and money making lines, but is also a prominent feature in their entire product line up. High quality materials, an eye for culture, and the ability to take into account the history they’re work should embody are present in everything I’ve seen from them so far. 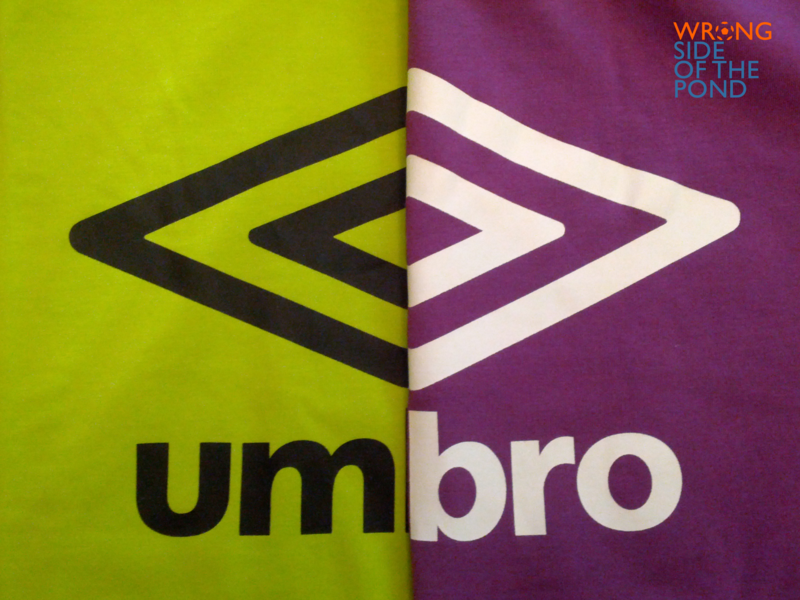 At bare minimum, Umbro knows their own persona, their own identity. And with their Tailored by Umbro line of apparel, you can tell they’re trying to build their company spirit into each piece of the collection. And as the pictures above show, it can yield marvelous results. Looking to the past to help guide your future. Building upon both what you have done and what you hope to do. Traditions matter. Drive forward, but remember who you are. And of course, many thanks to Umbro for keeping me in the loop. DJ….great post! I love the gear and the pic is fantastic!